报告人简介： Dr Minghui Dong is the Head of Voice Analysis and Synthesis Lab in Human Language Technology Department of Institute for Infocomm Research (I2R). He received BS, MS, and PhD from University of Science and Technology of China, Peking University, and National University of Singapore respectively. His research interests include speech and singing voice synthesis, voice conversion, natural language processing, speech recognition, etc. He was a research engineer from 1995 to 1998 at the Institute of Computer Science and Technology in Peking University (ICST,PKU) in China, where he worked on Chinese character recognition. From 2001 to 2004, he worked as a researcher in Infotalk Technology Pte Ltd (InfoTalk) in Singapore, where he did R&D work on text-to-speech systems. In Dec 2004, he joined the Institute for Infocomm Research (I2R). Here, he has been working on speech synthesis, voice conversion, singing voice processing, speech recognition and natural language processing. He is the vice president of Chinese and Oriental Languages Information Processing Society (COLIPS). He has been involved in organizing quite a few of international conferences. 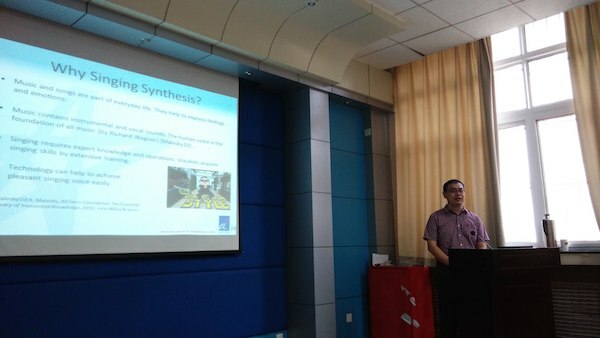 Recently, he is serving as Area Co-Chair in Speech Synthesis for Interspeech 2014, Program Co-Chair of International Symposium on Chinese Spoken Language Processing (ISCSLP) 2014, and Conference Chair of International Conference on Asian Language Processing (IALP) 2014. 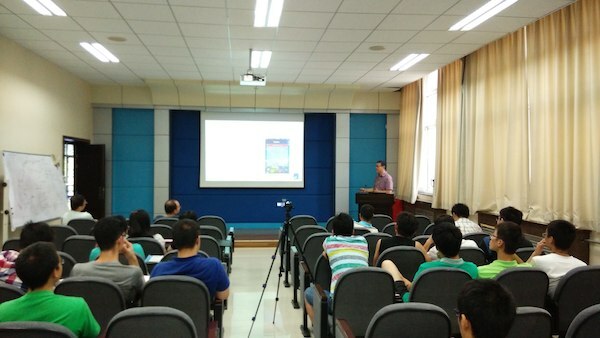 报告摘要： In this talk, I will first give a brief introduction of the voice synthesis work in I2R. Next I will focus on our latest work on singing voice synthesis. Singing is a way to express emotion. Many people like singing, but it need some skills to sing well. We are trying to generate nice singing voice with technology. Singing voice synthesis is an extended research topic of speech synthesis. Many of the research approaches for speech synthesis can be used in singing voice synthesis. However, singing has some unique features. Thus it needs to be handled differently in some way. This talk will cover our research work on singing pitch modelling, automatic harmonizer, speech2singing conversion, etc. A short demo will also be given as well.